New Study Shakes Up Science On Midwest Quake Zone : The Two-Way The fault that sparked a series of magnitude 7 earthquakes in 1811-12 had been thought dead, but the latest research suggests the region is still alive and kicking. 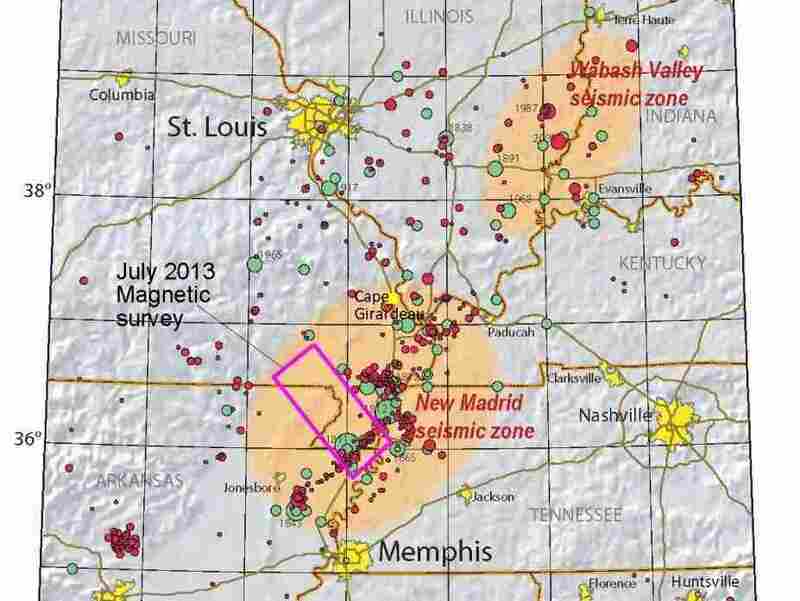 Map showing seismic activity in the New Madrid Seismic Zone. One of the biggest earthquakes in U.S. history didn't occur in California. Or Alaska. It happened in the country's midsection some 200 years ago in an area where today seven states straddle the Mississippi River Valley. And seismologists from the United States Geological Survey believe they've uncovered evidence that the New Madrid Seismic Zone, as the area that spawned the 1811-12 quakes is known, is still alive and kicking. In the early 19th century, not many people lived in the region, but for those who did, the earthquakes must have been a gut-wrenching experience, says Susan Hough, a seismologist with the USGS in Pasadena, Calif., in an interview with NPR's All Things Considered. Hough and co-author Morgan Page, a fellow USGS seismologist, published their findings in Thursday's issue of the journal Science. Hough says that since there were no seismometers at the time, scientists can only guess at strength of the quakes. They think that the strongest were at least magnitude 7. "They were felt all the way to the East Coast," she tells ATC host Melissa Block. "They rang church bells in Charleston, S.C. One of the documented fatalities was actually near Louisville, Ky., which is relatively far from the New Madrid zone." USGS says the first of magnitude 7 quakes struck at 2 a.m. on Dec. 16, 1811. Two others followed on Jan. 23 and Feb. 7. "Intermittent strong shaking continued through March 1812 and aftershocks strong enough to be felt occurred through the year 1817," USGS says. "A large area was thoroughly disrupted around the common borders of Missouri, Arkansas, Tennessee, Kentucky and Illinois. Riverbanks collapsed, farm fields erupted in mud and sand, large areas of land turned to jelly, and part of northwestern Tennessee sank and filled with water to form Reelfoot Lake." Although the region is still deemed "a high hazard zone" for earthquakes, Hough says, the prevailing hypothesis is still that the past 200 years of mostly weak temblors are all essentially aftershocks of the 1811-1812 quakes. "In recent years, a handful of studies claimed the New Madrid was settling down instead of prepping for another round of earthquakes. But the USGS team instead suggests that ongoing earthquakes in the New Madrid Seismic Zone are something new, resulting from the buildup of seismic energy on the faults.
" 'Even though we can't predict earthquakes, we can predict the rates of aftershocks over time,' [lead author] Page explains. The frequency of aftershocks — smaller quakes that follow the big earthquake — decreases with time, known in seismology as Omori's Law. And in the New Madrid Seismic Zone, the aftershocks aren't following Omori's Law." So, the research by Page, Hough, et al., has left conventional thinking about New Madrid on shaky ground. "Every indication is that there are active processes going on deep in the crust and we're not sure what they are and why they are happening, but our results show us that something is alive and kicking down there," Hough tells NPR. "We keep generating these small earthquakes, which we conclude are not aftershocks." So, could middle America experience another "big one" on the same order as the historic quakes? "From what we know about New Madrid, the expectation is that a magnitude 7 earthquake might occur once every 500 years and a magnitude 6-ish event might happen on average once every 50 years," Hough says. "It's [been since] 1895 ... [that] we've seen the last event close to magnitude 6," she says. "It's not going to go off anytime soon, but we do have evidence that more stress is being built up now," says co-author Page. "Eventually, that energy will have to be released in a large earthquake."